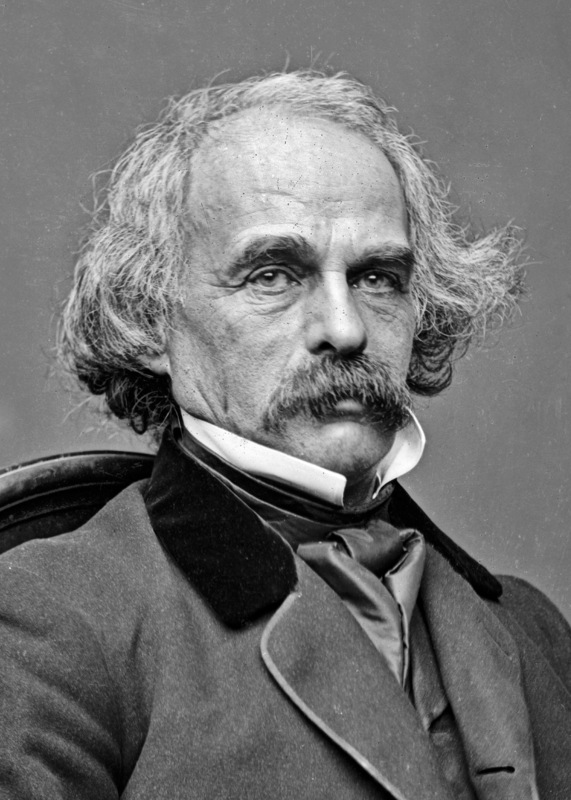 American novelist: b. Salem, Mass., 4 July 1804; d. Plymouth, N. H., 19 May 1864. The founder of the family in America was William Hathorne (as the name was then spelled), a typical Puritan and a public man of importance. John, his son, was a judge, one of those presiding over the witchcraft trials. Of Joseph in the next generation little is said, but Daniel, next in decent, followed the sea and commanded a privateer in the Revolution, while his son Nathaniel, father of the romancer, was also a sea Captain. This pure New England descent gave a personal character to Hawthorne's presentations of New England life; when he writes of the strictness of the early Puritans, of the forests haunted by Indians, of the magnificence of the provincial days, of men high in the opinion of their towns-people, of the reaching out to far lands and exotic splendors, he is expressing the stored-up experience of his race. His father died when Nathaniel was but four and the little family lived a secluded life with his mother. He was a handsome boy and quite devoted to reading, by an early accident which for a time prevented outdoor games. His first school was with Dr. Worcester, the lexicographer. In 1818 his mother moved to Raymond, Me., where her brother had bought land, and Hawthorne went to Bowdoin College. He entered college at the age of 17 in the same class with Longfellow. In the class above him was Franklin Pierce, afterward 12th President of the United States. On being graduated in 1825 Hawthorne determined upon literature as a profession, but his first efforts were without success. ‘Fanshawe’ was published anonymously in 1828, and shorter tales and sketches were without importance. Little need be said of these earlier years save to note that they were full of reading and observation. In 1836 he edited in Boston the American Magazine for Useful and Entertaining Knowledge, but gained little from it save an introduction to ‘The Token,’ in which his tales first came to be known. Returning to Salem he lived a very secluded life, seeing almost no one (rather a family trait), and devoted to his thoughts and imaginations. He was a strong and powerful man, of excellent health and, though silent, cheerful, and a delightful companion when be chose. But intellectually he was of a separated and individual type, having his own extravagances and powers and submitting to no companionship in influence. In 1837 appeared ‘Twice Told Tales’ in book form: in a preface written afterward Hawthorne says that he was at this time “the obscurest man of letters in America.” Gradually he began to be more widely received. In 1839 he became engaged to Miss Sophia Peabody, but was not married for some years. In 1838 he was appointed to a place in the Boston custom house, but found that he could not easily save time enough for literature and was not very sorry when the change of administration put him out of office. In 1841 was founded the socialistic community at Brook Farm: it seemed to Hawthorne that here was a chance for a union of intellectual and physical work, whereby he might make a suitable home for his future wife. It failed to fulfil his expectations and Hawthorne withdrew from the experiment. In 1842 he was married and moved with his wife to the Old Manse at Concord just above the historic bridge. Here chiefly he wrote the ‘Mosses of an Old Manse’ (1846). In 1845 he published a second series of ‘Twice Told Tales’; in this year also the family moved to Salem, where he had received the appointment of surveyor at the custom house. As before, official work was a hindrance to literature; not till 1849 when he lost his position could he work seriously. He used his new-found leisure in carrying out a theme that had been long in his mind and produced ‘The Scarlet Letter’ in 1850. This, the first of his longer novels, was received with enthusiasm and at once gave him a distinct place in literature. He now moved to Lenox, Mass., where he began on ‘The House of Seven Gables,’ which was published in 1851. He also wrote ‘A Wonder-Book’ here, which in its way has become as famous as his more important work. In December 1851 he moved to West Newton, and shortly to Concord again, this time to the Wayside. At Newton he wrote ‘The Blithedale Romance.’ Having settled himself at Concord in the summer of 1852, his first literary work was to write the life of his college friend, Franklin Pierce, just nominated for the Presidency. This done he turned to ‘Tanglewood Tales,’ a volume not unlike the ‘Wonder-Book.’ In 1853 he was named consul to Liverpool: at first he declined the position, but finally resolved to take this opportunity to see something of Europe. He spent four years in England, and then a year in Italy. As before, he could write nothing while an official, and resigned in 1857 to go to Rome, where he passed the winter, and to Florence, where he received suggestions and ideas which gave him stimulus for literary work. The summer of 1858 he passed at Redcar, in Yorkshire, where he wrote ‘The Marble Faun.’ In June 1860 he sailed for America, where he returned to the Wayside. For a time he did little literary work; in 1863 he published ‘Our Old Home,’ a series of sketches of English life, and planned a new novel, ‘The Dolliver Romance,’ also called ‘Pansie.’ But though he suffered from no disease his vitality seemed relaxed; some unfortunate accidents had a depressing effect, and in the midst of a carriage trip into the White Mountains with his old friend, Franklin Pierce, he died suddenly at Plymouth, N. H., early in the morning, 19 May 1864. The works of Hawthorne consist of novels, short stories, tales for children, sketches of life and travel and some miscellaneous pieces of a biographical or descriptive character. Besides these there were published after his death extracts from his notebooks. Of his novels ‘The Scarlet Letter’ is a story of old New England; it has a powerful moral idea at bottom, but it is equally strong in its presentation of life and character in the early days of Massachusetts. ‘House of the Seven Gables’ presents New England life of a later date; there is more of careful analysis and presentation of character and more description of life and manners, but less moral intensity. ‘The Blithedale Romance’ is less strong; Hawthorne seems hardly to grasp his subject. It makes the third in what may be called a series of romances presenting the molding currents of New England life: the first showing the factors of religion and sin, the second the forces of hereditary good and evil, and the third giving a picture of intellectual and emotional ferment in a society which had come from very different beginnings. ‘Septimius Felton,’ finished in the main but not published by Hawthorne, is a fantastic story dealing with the idea of immortality. It was put aside by Hawthorne when he began to write ‘The Dolliver Romance,’ of which he completed only the first chapters. ‘Dr. Grimshaw's Secret’ (published in 1882) is also not entirely finished. These three books represent a purpose that Hawthorne never carried out. He had presented New England life, with which the life of himself and his ancestry was so indissolubly connected, in three characteristic phases. He had traced New England history to its source. He now looked back across the ocean to the England he had learned to know, and thought of a tale that should bridge the gulf between the Old World and the New. But the stories are all incomplete and should be read only by the student. The same thing may be said of ‘Fanshawe,’ which was published anonymously early in Hawthorne's life and later withdrawn from circulation. ‘The Marble Faun’ presents to us a conception of the Old World at its oldest point. It is Hawthorne's most elaborate work, and if every one were familiar with the scenes so discursively described, would probably be more generally considered his best. Like the other novels its motive is based on the problem of evil, but we have not precisely atonement nor retribution, as in his first two novels. The story is one of development, a transformation of the soul through the overcoming of evil. The four novels constitute the foundation of Hawthorne's literary fame and character, but the collections of short stories do much to develop and complete the structure. They are of various kinds, as follows: (1) Sketches of current life or of history, as ‘Rills from the Town Pump,’ ‘The Village Uncle,’ ‘Main Street,’ ‘Old News.’ These are chiefly descriptive and have little story; there are about 20 of them. (2) Stories of old New England, as ‘The Gray Champion,’ ‘The Gentle Boy,’ ‘Tales of the Province House.’ These stories are often illustrative of some idea and so might find place in the next set. (3) Stories based upon some idea, as ‘Ethan Brand,’ which presents the idea of the unpardonable sin; ‘The Minister's Black Veil,’ the idea of the separation of each soul from its fellows; ‘Young Goodman Brown,’ the power of doubt in good and evil. These are the most characteristic of Hawthorne's short stories; there are about a dozen of them. (4) Somewhat different are the allegories, as ‘The Great Stone Face,’ ‘Rappacini's Daughter,’ ‘The Great Carbuncle.’ Here the figures are not examples or types, but symbols, although in no story is the allegory consistent. (5) There are also purely fantastic developments of some idea, as ‘The New Adam and Eve,’ ‘The Christmas Banquet,’ ‘The Celestial Railroad.’ These differ from the others in that there is an almost logical development of some fancy, as in case of the first the idea of a perfectly natural pair being suddenly introduced to all the conventionalities of our civilization. There are perhaps 20 of these fantasies. Hawthorne's stories from classical mythology, the ‘Wonder-Book’ and ‘Tanglewood Tales,’ belong to a special class of books, those in which men of genius have retold stories of the past in forms suited to the present. The stories themselves are set in a piece of narrative and description which gives the atmosphere of the time of the writer, and the old legends are turned from stately myths not merely to children's stories, but to romantic fancies. Mr. Pringle in ‘Tanglewood Fireside’ comments on the idea: “Eustace,” he says to the young college student who had been telling the stories to the children, “pray let me advise you never more to meddle with a classical myth. Your imagination is altogether Gothic and will inevitably Gothicize everything that you touch. The effect is like bedaubing a marble statue with paint. This giant, now! How can you have ventured to thrust his huge disproportioned mass among the seemly outlines of Grecian fable?” “I described the giant as he appeared to me,” replied the student, “And, sir, if you would only bring your mind into such a relation to these fables as is necessary in order to remodel them, you would see at once that an old Greek has no more exclusive right to them than a modern Yankee has. They are the common property of the world and of all time” (“Wonder-Book,” p. 135). ‘Grandfather's Chair’ was also written primarily for children and gives narratives of New England history, joined together by a running comment and narrative from Grandfather, whose old chair had come to New England, not in the Mayflower, but with John Winthrop and the first settlers of Boston. ‘Biographical Stories,’ in a somewhat similar framework, tells of the lives of Franklin, Benjamin West and others. It should be noted of these books that Hawthorne's writings for children were always written with as much care and thought as his more serious work. ‘Our Old Home’ was the outcome of that less remembered side of Hawthorne's genius which was a master of the details of circumstance and surroundings. The notebooks give us this also, but the American notebook has also rather a peculiar interest in giving us many of Hawthorne's first ideas which were afterward worked out into stories and sketches. One element in Hawthorne's intellectual make-up was his interest in the observation of life and his power of description of scenes, manners and character. This is to be seen especially, as has been said, in his notebooks and in ‘Our Old Home,’ and in slightly modified form in the sketches noted above. These studies make up a considerable part of ‘Twice Told Tales’ and ‘Mosses from an Old Manse,’ and represent a side of Hawthorne's genius not always borne in mind. Had this interest been predominant in him we might have had in Hawthorne as great a novelist of our everyday life as James or Howells. In the ‘House of Seven Gables’ the power comes into full play; 100 pages hardly complete the descriptions of the simple occupations of a single uneventful day. They are fantastic enough, but generally they are developments of some moral idea and a still more ideal development of such conceptions was not uncommon in Hawthorne. ‘Rappacini's Daughter’ is an allegory in which the idea is given a wholly imaginary setting, not resembling anything that Hawthorne had ever known from observation. These two elements sometimes appear in Hawthorne's work separate and distinct just as they did in his life: sometimes he secluded himself in his room, going out only after nightfall; sometimes he wandered through the country observing life and meeting with everybody. But neither of these elements alone produced anything great, probably because for anything great we need the whole man. The true Hawthorne was a combination of these two elements, with various others of personal character, and artistic ability that cannot be specified here. The most obvious combination between these two elements, so far as literature is concerned, between the fact of external life and the idea of inward imagination, is by a symbol. The symbolist sees in everyday facts a presentation of ideas. Hawthorne wrote a number of tales that are practically allegories: ‘The Great Stone Face’ uses facts with which Hawthorne was familiar, persons and scenes that he knew, for the presentation of a conception of the ideal. His novels, too, are full of symbolism. ‘The Scarlet Letter’ itself is a symbol and the rich clothing of Little Pearl, Alice's posies among the Seven Gables, the old musty house itself, are symbols, Zenobia's flower, Hilda's doves. But this is not the highest synthesis of power, as Hawthorne sometimes felt himself, as when he said of ‘The Great Stone Face,’ that the moral was too plain and manifest for a work of art. However much we may delight in symbolism it must be admitted that a symbol that represents an idea only by a fanciful connection will not bear the seriousness of analysis of which a moral idea must be capable. A scarlet letter A has no real connection with adultery, which begins with A and is a scarlet sin only to such as know certain languages and certain metaphors. So Hawthorne aimed at a higher combination of the powers of which he was quite aware, and found it in figures and situations in which great ideas are implicit. In his finest work we have, not the circumstance before the conception or the conception before the circumstance, as in allegory. We have the idea in the fact, as it is in life, the two inseparable. Hester Prynne's life does not merely present to us the idea that the breaking of a social law makes one a stranger to society with its advantages and disadvantages. Hester is the result of her breaking that law. The story of Donatello is not merely a way of conveying the idea that the soul which conquers evil thereby grows strong in being and life. Donatello himself is such a soul growing and developing. We cannot get the idea without the fact, nor the fact without the idea. This is the especial power of Hawthorne, the power of presenting truth implicit in life. Add to this his profound preoccupation with the problem of evil in this world, with its appearance, its disappearance, its metamorphoses, and we have a due to Hawthorne's greatest works. In ‘The Scarlet Letter,’ ‘The House of Seven Gables,’ ‘The Marble Faun,’ ‘Ethan Brand,’ ‘The Gray Champion,’ the ideas cannot be separated from the personalities which express them. It is this which constitutes Hawthorne's lasting power in literature. His observation is interesting to those that care for the things that he describes, his fancy amuses, or charms or often stimulates our ideas. His short stories are interesting to a student of literature because they did much to give a definite character to a literary form which has since become of great importance. His novels are exquisite specimens of what he himself called the romance, in which the figures and scenes are laid in a world a little more poetic than that which makes up our daily surrounding. But Hawthorne's really great power lay in his ability to depict life so that we are made keenly aware of the dominating influence of moral motive and moral law.